In my free German lessons I am going to show you that it is possible to learn basic German on your own. Even if you are determined to take your German language skills to a professional level, you can learn German online at your own pace. There are many reasons why you should consider to learn German (Deutsch). After all, Deutsch is one of the key languages in Europe, spoken by more than 120 million people. Whether you visit Germany for business, as an exchange student, or for a holiday, it is good to know a few German phrases and basic German sentences. My German lessons include words and phrases, basic grammar rules, and tips to useful online resources. Is it difficult to learn Deutsch? Well, we have a saying "Deutsche Sprache, schwere Sprache" (German language, difficult language) is even used by Germans when we struggle with our own grammar rules. On the other hand, Deutsch and English are closely related, as is Dutch. So you will find many similarities between the two languages. First lesson - Du or Sie? 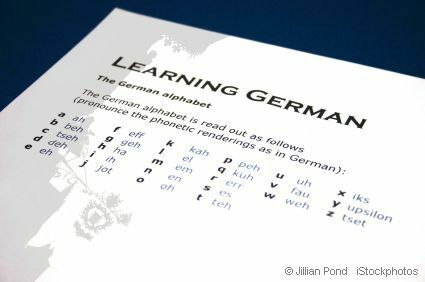 This lesson tells you about one of the most important differences between English and German speaking countries. If you talk to someone in English you always say you, which make things quite easy. In Deutsch there is the Du (informal, implies intimacy and friendship) and the Sie (formal, implies distance and respect). So if you meet an adult for the first time, you usually use the formal "Sie". Especially in the business world it is important to know this rule and stick to it. Having said that, nobody will be really offended if you don't get the "Du or Sie" right in the beginning. At the worst, your conversational partner might be slightly bemused. Fräulein (Miss) used to be the title for unmarried women, but this is not appropriate anymore. So always use Frau. Guten Tag Herr/Frau Müller, ich freue mich Sie kennenzulernen - Good Day/Hello Mr. / Ms. Miller, I am pleased to meet you. Wie geht es Ihnen? - How are you? In business/formal situations the answer to "Wie geht es Ihnen" is usually a short "Danke gut" (Fine, thank you), or "Danke, es geht so" (Thank you, so-so). Hallo Peter, schön dich zu sehen - Hello Peter, nice to see you. Wie geht es Dir? / Wie geht's? - How are you? Once you know people well, and ask "Wie geht es Dir?" you can expect a longer speech, especially if they have been ill, or faced problems recently. By the way, did you know that "Thomas Müller" is the most common name in Germany? When and how do you change from the formal "Sie" to the informal "Du"? Well, in the business world, when you deal with authorities, at the doctor's, and in shops, the change from "Sie" to "Du" might never happen, even if you know people for quite some time, and get along with them very well. As a general rule, wait until people in higher positions and those who are older than you offer you "Wir können auch "Du" sagen", or "Wir können uns duzen" (We can say "Du" to each other). On the other hand, it is quite common that colleagues at work are "per du". Younger people and students are usually "per du" with each other. When someone introduces themself with his/her firstname, it means they are comfortable to say Du. There is no general age limit when young adults start saying "Sie" to each other. It just happens at a certain time. I remember when a young colleague of mine was rather frustrated when someone in a disco said "Sie" to her. She felt very old then.